NASA Tweetup News: Guess Who’s Making Yet Another Trip To Florida’s Space Coast? 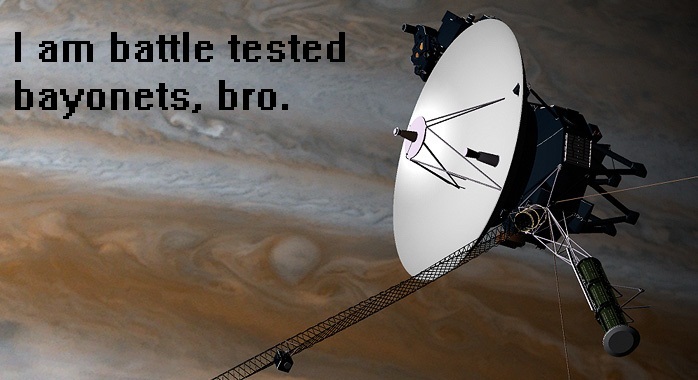 Not Mission Juno’s probe, but an artist’s rendering of when Voyager 2 went all Charlie Sheen during its Jupiter flyby. Depiction by NASA, snarky caption added by me. I was selected to go to the NASA Tweetup of Mission Juno’s launch in early August from an Atlas V 551 rocket at Kennedy Space Center. I just got the e-mail tonight. Mission Juno will be traveling to Jupiter in the next few years to discover more about the solar system’s Giant Planet, plus hopefully it will unlock some secrets about our own Earth’s formation as well. Generally, it’s following in its big sister Voyager’s footsteps, and then some. Of course I am going, and I will be providing my readers with tons of updates and pictures, which will culminate in Juno being launched at approximately 11:39 AM on August 5th. I should be right by the countdown clock. So stay tuned for many, many updates!